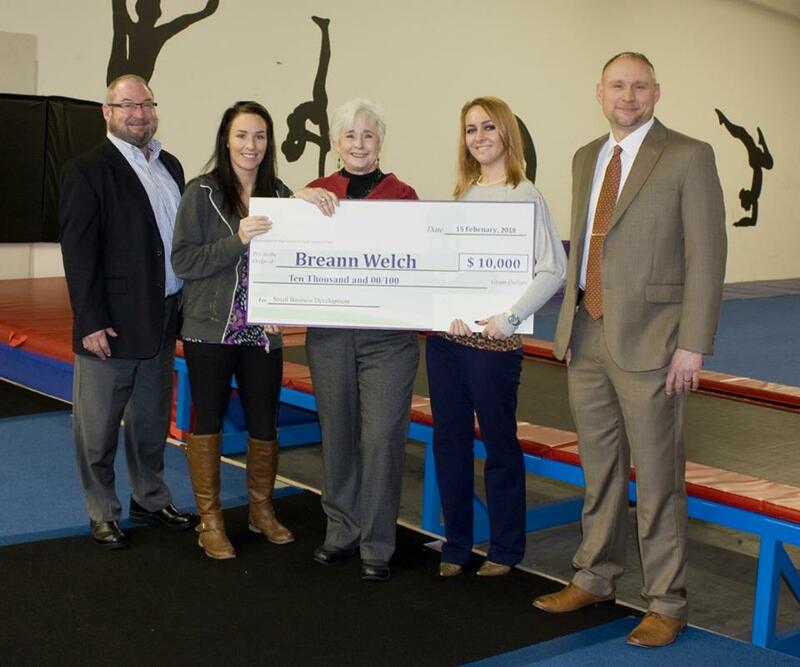 Clinch-Powell presented a check to Breann Welch, owner of Sweet Southern Tumbling, through their Small Business Loan Program funded by USDA - Rural Development. Presenting the check are Cherry Acuff, Clinch-Powell Board Chair, and Sabrina Seamon, Clinch-Powell Deputy Executive Director. In attendance were Charles Morris, Business Program Area Specialist with USDA Rural Development; Bruce Hayes, Director of TN Small Business Development Center and Candy Barbee, Appalachia CARES AmeriCorps member at Clinch-Powell. This loan enables Sweet Southern Tumbling to expand its class offerings by upgrading its current equipment and purchasing additional equipment and floor mats. The business recently moved into a larger space. This loan not only allows for more class participation but allows classes to be held simultaneously. Already her class attendance has expanded from 120 students to 200 since she moved. It supports the community with additional staff positions and an expanded after- school physical activity program for ages 3-17. Clinch-Powell partnered with USDA - Rural Development to package these loans in our service area in order to stimulate economic development in rural East Tennessee. The loan fund provides affordable financing to small businesses and entrepreneurs located in rural East TN areas meeting USDA RD definitions. These loans, which can be up to $45,000.00 are primarily for equipment, real property and some contracted materials for small businesses. Eligible areas include Campbell, Claiborne, Cocke, Grainger, Greene, Hamblen, Hancock, Hawkins, Jefferson and Union counties. Loans are below market interest rate, based on credit scores and require acceptable collateral. Business owners will be required to submit a basic business plan. For more information on Clinch-Powell’s Small Business Loan Program call (865) 828-5927. You may apply on the website at www.clinchpowell.net. For additional information on Sweet Southern Tumbling and Cheer Classes, please call Breann at (865) 680-2772. The all-star cheer program try-outs for ages 5-17 are May 26, 2018.